Dogs can sense a lack of confidence so walk tall. 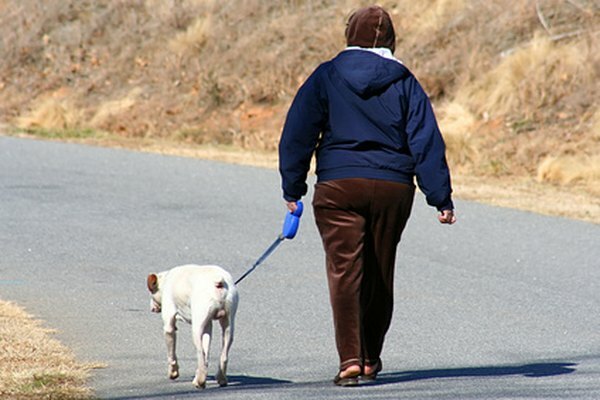 Walking is a natural act for dogs, but walking in front of you is not his natural position. Keep your dog on a loose leash, so he can explore without pulling you. You decide where to go and he follows your lead. Call your dog to you. It's time for a walk, but don't go to the dog. As pack leader, he needs to come to you. Command your pup to sit; snap on the leash. Before any walk, he needs to become calm and submissive. Dogs love to walk and can get excited. Once he is in an excited state, he will want to pull ahead and take charge. Open the door and step in front of your dog. Command him to sit. Step outside the door and give him permission to follow. Give a command such as let's go or come along. Start walking and keep the leash loose. Guide the dog to follow you. If he starts to pull ahead, stop. Don't let him pull you. Once the leash is loose, continue to walk. Continue to walk forward and keep the leash loose. If your pup sees something and won't stop pulling, turn around and go in another direction. He has no choice but to follow. Reward your dog. When he looks at you, say "good boy." You may choose to give him a treat. The idea is to make the walk an enjoyable experience for you and for him. Walk your dog every day. Be patient and diligent. Your dog will soon learn to follow your lead. If you see another dog, keep moving forward. If you want to stop and talk with a passerby, command your dog to sit. Once your dog understands what you want from him, eliminate the treats. What Size of Leash Should You Get for Your Labrador Puppy? Can Poodles Be Trained to Walk Off of a Leash?